While we are not typically open to the public, the Nueces Delta Preserve does host some public and special events throughout the year. Events listed are FREE to the public unless otherwise mentioned, and registration is highly encouraged. For more information on events at the NDP, please email education@cbbep.org. 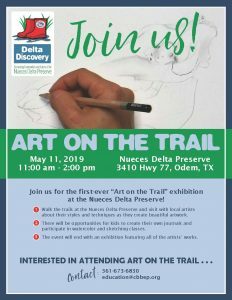 Come walk the trails at the Nueces Delta Preserve and visit with local artists about their styles and techniques as they create beautiful artwork. There will be opportunities for kids to create their own journals and participate in watercolor and sketching classes. The event will end with an exhibition featuring all of the artists’ works! Come and spend a few hours out with us at the Delta! Our Delta Discovery Picnics allow students who have visited the Delta through a school field trip to bring their families, share what they’ve learned, and explore a little more, but of course, everyone is welcome to come enjoy the sights and sounds of the Nueces Delta Preserve. Please bring a picnic lunch, picnic blanket, sunscreen/bug repellant, and plenty of water for everyone (we recommend at least two bottles per person). Staff will be scattered around the area to answer questions and give background information on plants, animals, and history. We look forward to seeing you out there! Bring your homeschool students to the Nueces Delta Preserve! The Education Staff is excited to announce that we are hosting 2 Fall and 2 Spring Semester homeschool experiences for your K-2, 3-5, 6-8 and 9-12th grader. These Homeschool Days will allow families an opportunity to connect science curriculum to the Coastal Bend using guided discovery. These programs will be adapted to meet the developmental needs of children at their specific K-12 learning levels. September 7, 2018: Come explore the WATER that touches the world at the Nueces Delta Preserve. November 2, 2018: Come explore the SOILS of the Nueces Delta Preserve! February 1, 2019: Come explore the Nueces Delta Preserve and learn why this ecosystem is important and how you can help CONSERVE this natural resource! April 5, 2019: Come explore the beauty and importance of POLLINATORS at the Nueces Delta Preserve. Space is limited to 15 students per group and is available on a first come first serve basis. Join us at the Nueces Delta Preserve for Nature Story Time on the second Tuesday of the month from 9:00 – 10:30 am. Each story time session will focus on a theme and will allow children, with parent or caregiver, to enjoy days at the Delta with nature-themed stories and other activities including nature walks, crafts, and/or live animals. Story Time activities will be targeted for ages 2 -5, but all are welcome. Dress for outdoor activity. Nature Story Times are held outdoors, except in extreme weather conditions. Starting in June, Nature Story Time will be held twice a month on the second and fourth Tuesday of the month through August. Please bring your own snacks and bottled water. The goal of Texas Nature Challenge is to get families and kids outdoors by visiting as many participating parks and nature areas in Texas as they can. At each site, participants complete activity challenges designed for family fun and nature exploration. This year’s Nature Challenge Event at the Nueces Delta Preserve will be held in conjunction with our Delta Discovery Family Picnic Day on September 8, 2018. This will be your only opportunity to participate in the NDP’s Nature Challenge. The closing ceremonies will be held at the Nueces Delta Preserve on November 10, 2018 10:00 am – 12:00pm. Youth Odyssey is a 501 (c) (3) nonprofit on a mission to provide at-risk youth, ages 10-17, with positive youth development through adventure programming. We are proud to partner with such worthy partners for special events at the Nueces Delta Preserve.